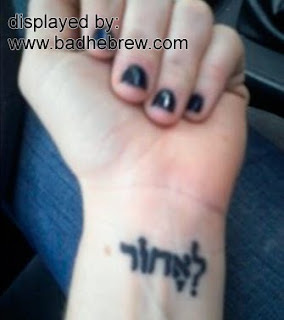 Bad Hebrew Tattoos: Where's Her Future? Fate (or a malicious friend), however, ruined her plans thoroughly. I don't know where this girl got her translation for "The Future" from, but she could hardly manage something further from the original intent. Her tattoo, in fact, says "Backward" or "To the Back", in Hebrew. Many backward Hebrew tattoos made their appearance on this blog, but none of them actually spelled out the word. This is something brand new! Lucky for her, it wasn't "מאחור" (from behind). Me think we not give enough credit to these sly ink-nics. "Ruchal" here nicely encoded her name, in reverse, with the clue cleverly appearing as the purported text. Genius. that Ruchaleh. Did she get the wrong word from a translation of "Back to the Future"? Anonymous: No, that would be בחזרה (Baxazara) and not לאחור (Le'axor). Our inked friend may in fact be a terrific Hebraist. לאחור certainly means backward, yet she may have actually known that. Hebrew follows a space-time paradigm that is the opposite of most other languages. In English, we imagine ourselves walking forward into the future. For example, we have phrases like "I'm looking forward to next Tuesday" and "my past is behind me now". However, in Hebrew, the relationship between time and space is the opposite, that is, we walk backward into the future. This is obvious from the use of the words לפני and אחרי. Indeed, לפני has a spacial meaning of "in front of" and a temporal meaning of "before", whereas אחרי has a spacial meaning of "behind" and a temporal meaning of "after". Therefore, לאחור could mean "after" or "later" if you follow the Ancient Hebrew paradigm. So Bravo on this tattoo! I think it perfectly embodies the phenomenon of spacial-temporal semantics in Hebrew!